Company History | Richard Septic Systems, Inc.
My father, Roger Richard started this company in 1946 as Richard's Well Tile Company, precasting concrete drain tile and well tile for the houses my uncle was building nearby. He made his first concrete septic tanks in 1952. The company has grown over the years and today it is a leading supplier of precast concrete septic tanks, leaching chambers, distribution boxes, dosing chambers, well tile, and more. 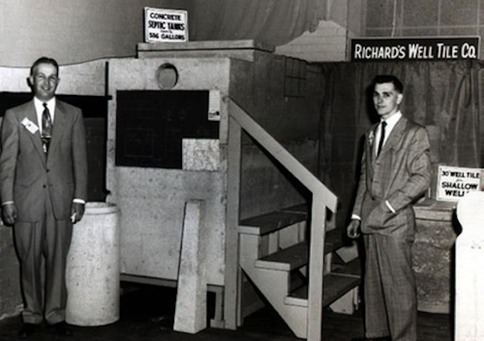 Roger Richard (L) made his first concrete septic tanks in 1952. Shown here at the Torrington Home Show in April 1952, Fred Vickers assists. Sister Lorraine 1948. Note the draintile in the foreground. Roger made 380 miles of it! We are less than 1 1/2 miles east of exit 46 of Connecticut Route 8. From the south,take Interstate 95 to Bridgeport,CT. Proceed 55 miles north on Rt. 8 to exit 46. Turn right, go to the end of Pinewoods Road, turn right and follow CT Rt. 183 south. Take your first left on Cedar Lane. We are 1/2 Mile down on both sides of the road. the office is on the right. From the north, take U.S. Rt. 44 to Winsted, CT or take Interstate 90 to Lee, MA andfollow Rt. 8 south to Winsted, CT. In Winsted take Rt. 8 south to the first exit which is Exit 46. At the end of the ramp turn left and go to the end of Pinewoods Road, turn right and follow CT Rt. 183 south. Take your first left on Cedar Lane. We are 1/2 Mile down on both sides of the road. The office is on the right.